We have kittens available for adoption! Please click on the "Available" button to see current pictures. The Ragdoll has an exceptionally gentle, well balanced temperament. It wants to be where you are, and will follow you everywhere. It is intelligent, playful, and affectionate. It will easily adapt to other cats, dogs, children and adults. This responsive cat may with training go for a walk on a leash, or ride beside you in a car. Some Ragdolls will fetch a favorite toy tossed in play, and will bring it back to you time and time again. The Ragdoll is an irresistibly huggable cat, growing exceptionally large and heavy. Full maturity of size and color are not to be expected for at least four years. Males may reach fifteen pounds or larger. Females will weigh about five pounds less, and be a few inches shorter. The Ragdoll is the largest breed of domesticated cat. The fur is long, silky, and non-matting. It flows into a luxurious ruff around the neck. The Ragdoll has feathery pantaloons on the back legs, and a fluffy tail. It has tufts of fur in the ears and between the toes. The Ragdoll also has a large furry muscle pendant on the abdomen, often referred as the "fatty pad". Adding to the Ragdoll's charm are it's large, oval, deep blue eyes. The Ragdoll is an "All American Breed". The breed was developed in the early 1960's by Ann Baker of California. 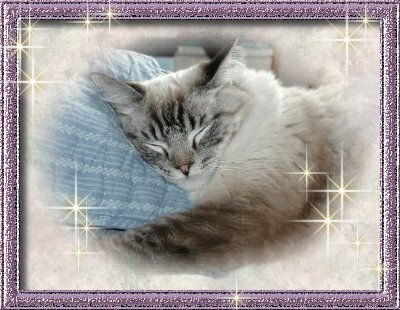 She named the breed Ragdoll, because of it's relaxed nature, and it's tendency to hang "limp" like a ragdoll when held. 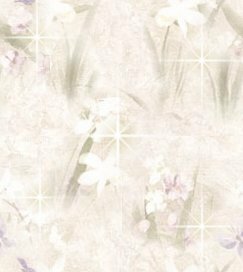 The Ragdoll does not display the aloofness and independence for which cats are generally known. Ragdolls are so friendly and gentle in fact, that they must not be allowed outdoors, for they do not suspect danger from other creatures, and will not run away or defend themselves. Ragdolls come in three patterns Colorpoint, Mitted, and Bicolor. The colorpoints have dark ears, legs, mask and tail, which provide a distinct contrast with the pale body color. Mitted Ragdolls have the dark, ears, legs, mask and tail of the colorpoint, but have white mittens, a white chin, and a white belly stripe. The Bicolor has a white patch that extends in an invertered "V" down a line through the eyes, and sweeps towards the back of the chin into the bib. The Bicolor's legs, chest, and underbelly are white, and they also have a saddle marking on the back that is slightly lighter in color than the point color. 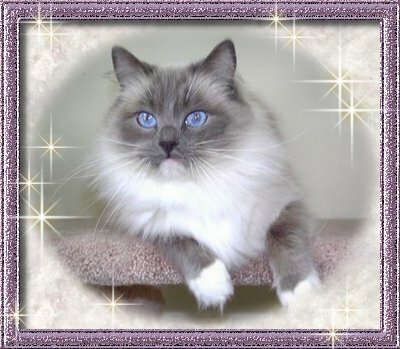 The colorpoint, mitted, and bicolor patterns are available in the following traditional colors of Seal, Blue, Chocolate, and Lilac. Non-traditional colors/patterns include Flame, Cream, Seal Tortie, Blue Tortie, Chocolate Tortie, and Lilac Tortie. The Lynx pattern has stripes on the points, and also comes in all of the colors listed above. Torbies are the result of a Tortie and Lynx breeding, having both stripes and patches of cream or flame on the points. Torbies are available in all colors as well. 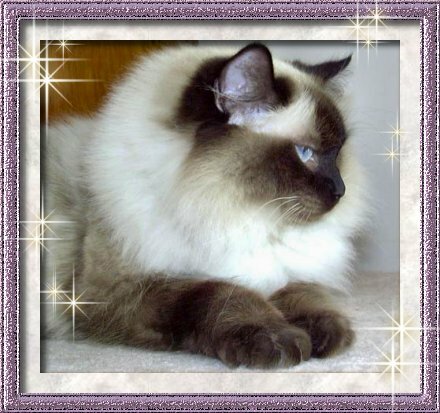 Here at Starlite Rags Cattery, it is our goal to breed Ragdolls the way they were meant to be......Gentle Giants with outstanding personalities. A teddy bear that purrs! Special emphasis is placed on health, personality and size, and of course great looks too! We offer Ragdoll kittens in the traditional colors of Seal, Chocolate, Blue and Lilac. Non traditional colors of Flame, Cream, Tortie, Torbie, and Lynx are also available. All of these colors are available in Colorpoint, Mitted, and Bicolor patterns. *For current pictures of our available kittens please click on the "Available" link below. Thank you!